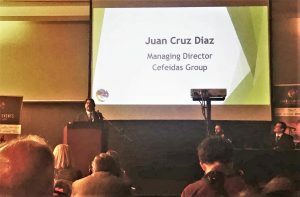 On April 9, managing director of Cefeidas Group, Juan Cruz Díaz, participated in the Argentina Gas & Oil Summit at the NH Hotel in Buenos Aires. He presented in a session focused on gas and oil investment in Argentina and gave context on the current political and economic climate alongside Jimena Blanco, head of Americas political research at Verisk Maplecroft, and Federico Cincotta, managing partner at Cincotta Advisory. The summit took place on April 9-10 and brought together stakeholders from various levels of government—including national Energy Secretary Gustavo Lopetegui and high-level provincial government officials—private-sector executives from hydrocarbons and energy companies, global consultancy firms, and civil society representatives.